The Naperville region of NaNoWriMo is partnering with many area libraries to offer write-in events in November for people to use to work on their novel while others around them are working on theirs. For more information see the Library Crawl page. All participants and their friends and family are welcome to attend the TGIO party at the Naperville Municipal Center. Come visit http://naperwrimo.org for more detailed event information. Fulfill your dream of becoming a novelist. 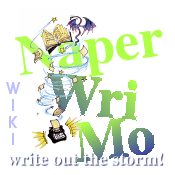 See http://www.nanowrimo.org and send your questions to mliaisons -AT- naperwrimo.org. A: We (Tim Yao, Sam McAdams and Jenny Johnson) are volunteer municipal liaisons for the Chicago Western Suburbs region of NaNoWriMo (Illinois::Naperville). We are enthusiastic participants of previous NaNo's who want to help others find the joy of completion that we've found. We organize the kick-off writing session, weekly writing sessions and the TGIO party at the end. This page was last modified on 1 December 2018, at 15:41.